Reliance Industries Chairman, Mukesh Ambani today opened India’s largest hypermarket – Reliance Mart @ Ahmedabad. Here is our exclusive initial coverage of the first Reliance Mart in India. August-15th was the first business day of the store. 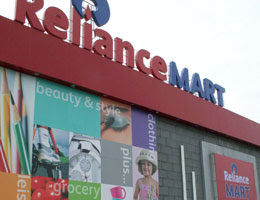 Reliance Retail expects to open 500 Retail Marts across India by the end of FY 2010. In smaller towns, these marts will be known as Reliance Town Centers. This store also has Tailors, Shoe Repair Center and a laundry 🙂 This is probably the first time in the world that a Hypermarket has a laundry. Our associate spotted Mukesh Ambani and Nita Ambani near the CD / DVD section inside the store. [See Picture Above – Mukesh was dressed in Plain White Silk Shirt, probably from their Vimal Mills :-)] Reliance Retail by 2010 will create 500,000 jobs and will be one of the top-5 employers in India. Worldwide financial analysts have a BUY recommendation on the stock of Reliance Industries Ltd, the holding company of all these mega ventures by Mukesh Ambani.